Corfu Hotels, apartments, accommodation: the quiet friendly Theo's Hotel, or Hotel Theo, Agios Georgios, Pagi, near Arillas and San Stefanos, Corfu, Ionian Islands, Greece. Agios Georgios (North) is a pleasant, quiet resort in a beautiful bay surrounded by olive grove covered hills in the lovely Greek island of Corfu. 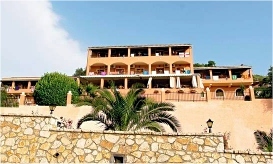 Nearby resorts are Arillas and San Stefanos. Some guests say ours is one of the friendliest hotels in Corfu. We aim to keep it like that. .." this popular hotel attracts many return guests. You can be sure of a friendly welcome at Theo's, which has a peaceful rustic atmosphere..."
In 2019 Theo's Hotel will once again be included in Thomsons 'Small and Friendly' summer 'Package Holidays' brochure and that company have the FULL booking rights for the months of June to September. Guests should book with that company via its travel offices and web-site. As usual Thomsons' customers will have coach transfers provided from the airport and the facilities of a Thomson's representative. Independent guests will ONLY be able to book with us for the month of MAY in 2019 (see Booking). Our prices are cheaper than many self-catering 2-person apartments and include breakfasts. If any of our new friends, and old ones too, can manage to take a holiday during the lovely fresh month of May we shall be very pleased to accommodate you. Transfers from the airport or port can be arranged. May is especially nice in Corfu for its fresh greenness and profusions of colourful wild flowers. Now come and see our hotel accommodation, lovely pool amongst beautiful Agios Georgios countryside.